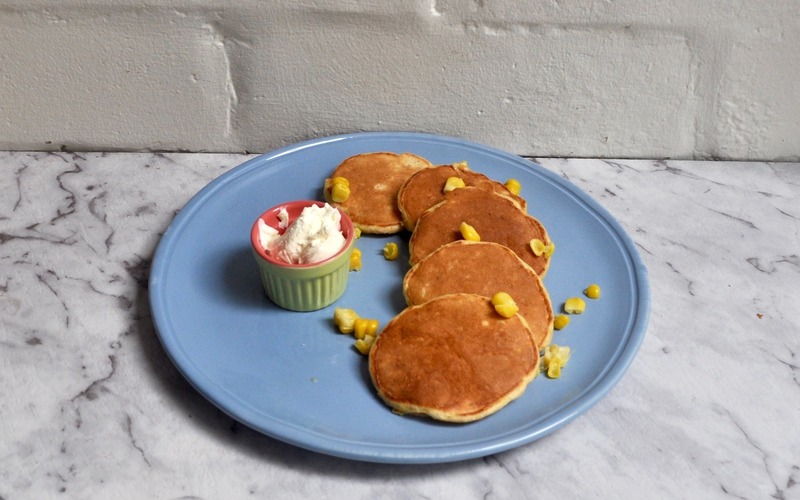 These sweetcorn drop scones – aka scotch pancakes – are a great savoury snack or lunch. When Mini Jones was young I would buy sweetcorn on the cob, boil it and puree it, then freeze in individual portions. Whilst Mini Jones likes these drop scones on their own or spread with cream cheese, Mr Jones and I eat them with chopped avocado, tomatoes and feta – and sometimes a rasher or two of crisp bacon. Mix the flour and baking powder together, make a well in the centre and pour in the egg, beat with a balloon whisk, gradually adding the milk and then the pureed sweetcorn. Heat a non-stick frying pan over a medium heat and drop dessert spoon fulls of the mixture and fry for about 2 minutes until bubbles appear on the surface and they are golden underneath. Flip over and fry another 1-2 minutes.